In addition to freediving, I am an avid surfer. I used to get swimmers ear and ear infections on a regular basis. Then, the guys at Ear Shield gave me some product to test. Believe me, this stuff works! When the water is warm, I just use the Ear Shield. When the water is cold, I use the Ear Shield plus my Doc’s Pro Plugs for added protection. If you are a year round waterman, this is an awesome combination that will save your ears and prevent infections. EarShield is a personal skin care cosmetic spray for conditioning and cleansing of the ears prior to water based activities. Delivering a fine metered spray of a unique blend of water repellent Olive, Mineral & Tea Tree Oil into the outer ear, finely coating the auditory canal, giving a conditioning water repellent and cleansing action. Each spray contains approximately 0.05ml of oil solution and should be sprayed into the ears prior to entering the water. EarSheild is packaged into a unique injection molded carrying case with a resealable lid. This allows the product to be carried in dive bags, swim bags, pool or beach bags without a chance of the product being accidentally dispensed. The case is also water resistant and designed to float if dropped into the water. Step 1: Apply Earshield Spray to both dry ears before entering the water. Pull the upper ear upwards and backwards (see diagram A). Step 2: Holding the bottle in an upright position with the nozzle placed into the ear canal press the actuator firmly (see diagram B). 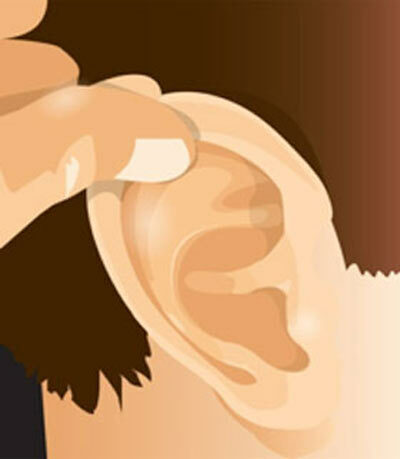 A single actuation per ear should be sufficient, then massage the side of the ear. Step 3: On exiting the water, tilt the head to left and right to allow any residual water to drain from the ears (see diagram C).